If you’re looking for a starter motor, simply use our selection tool below to find the correct part. 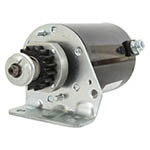 Picking the right starter motor for you. Simply follow the selection boxes below to help identify the starter motor you need. 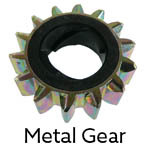 First, please select the type of gear you have. The easiest way to find the correct part for your engine is to find the original manufacturers part number, which is normally stamped on the unit its self or written in the parts manual (once you have this number, enter it into our keyword search box above), sometimes it is not possible due to wear/damage to the unit or the parts manual not being available. If this is the case if you find both the engine model and type number (which is usual stamped on the frame of the engine) and get in contact with us quoting these numbers, we can then consult our system to find the correct part for you. Briggs & Stratton are possibly the most commonly used engine provider when it comes to lawn and garden machinery. With over 60 engine models currently in production and 100s of previous models, the list of parts that go into these engines is extensive. Finding the correct part for your engine can sometimes be tricky as over time part numbers can wear off or be covered up. Thankfully we have a simple solution to tell which starter motor is the correct unit for your engine. 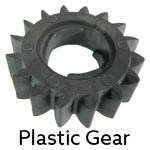 Simply by counting the number of teeth on the drive gear; noting the type of gear that is on the starter (plastic or metal); and the length of the black casing (Not including the end brackets) this will help to narrow down your search to 1-2 possible starter motors. Moto-Electrical are the leading supplier of electrical components in the UK, we supply high quality parts at competitive prices. Working with global companies such as Arrowhead; CRC; Xtreme; and RM Stator we strive not only to bring the best quality and prices on the market but also provide customers with the support and knowledge needed to make an informed decision when purchasing these products. Currently, we stock a wide range of parts for Briggs & Stratton engines, from starter motors to Ignition coils, which can be found above.